Preheat oven to 400°F and line a 10×6 inch loaf pan with parchment paper. In a medium bowl combine dry ingredients coconut flour, baking powder, Italian seasoning, 1 tablespoon rosemary or other seasonings and large pinch salt and pepper mix well set aside. Whisk together in a large bowl the wet ingredients eggs, coconut milk, apple cider vinegar until combined. Add the dry ingredients to the egg mixture. Pour batter into prepared loaf pan and even out batter. 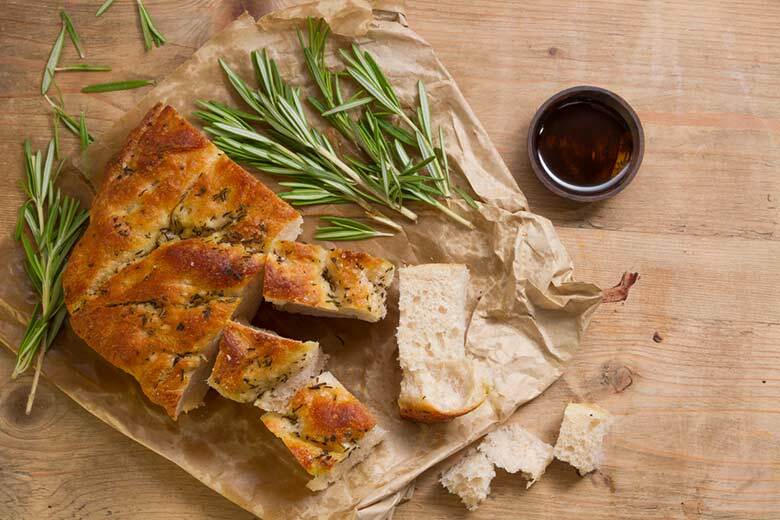 Brush on olive oil press garlic slices, olives and 1 tablespoon chopped rosemary into the top of the focaccia, gently pressing into the dough. Bake 25 minutes in oven, or until golden.